Chakra charm with a spring clasp. The charm has the stones of the seven chakras: amethyst, iolite, apatite, peridot, citrine, carnelian and garnet. Purity. 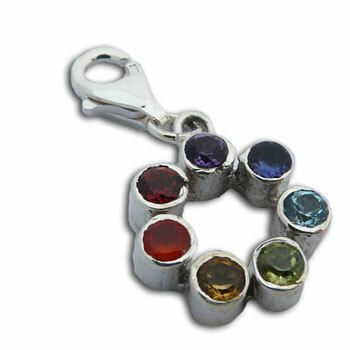 Seven chakra stones form a rainbow of color in this sterling silver seven chakra pendant.